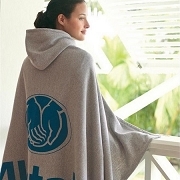 Our high quality sweatshirt blankets are enjoyable any time of year. Great for indoors or outdoors. 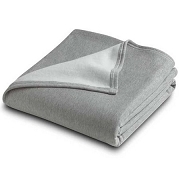 They are durably constructed with smooth jersey material on side and cozy fleece on the other. They can be customized with screen printing or embroidery, and are especially popular for schools and teams. Just like sweatshirts, they are warm and comfy without taking up a lot of space, so they're easy to travel with. 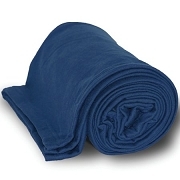 Choose from Standard 50" x 60" throw size, Jumbo 54" x 84" with lots of room for two.